One way to study how to make losing fun is to look at games that can’t, techncially, be “won.” Take pinball, for example. There’s no winning a pinball table; one never beats the game. In a sense, a pinball player is always losing, trying to accomplish as much as possible before inevitable defeat. Yet, good pinball games are just as much fun as they ever were, because pinball designers have mastered the use of sub-goals to create satisfying experiences. A reliable mechanism for making a game fun even for a player who’s losing is to provide subsidiary goals. Such goals give players who aren’t going to win–in the case of something like pinball, can never win–something to aim toward and take pride in. They beat the boss/saw the next cutscene/got the Steam achievement/etc., and that feels good. To work, these goals need to be independent of winning, measurable, and desirable. Being unrelated to winning is central; the player isn’t winning, but we want the player to be able to achieve these goals anyway. Measurability contributes to the player’s satisfaction by enabling the player to say decisively “I did X” without the benefit of an ending cinematic. Finally, desirability prevents these goals from feeling like booby prizes. Every time the player starts the game by launching the ball down the wire ramp along the right side of the table, she can choose how hard to hurl the ball. Getting just the right amount of force causes the ball to fall onto the table at the exact end of the ramp, a “skill shot” worth lots of points. That (a) has nothing to do with winning–the ball ends up on the table either way, (b) is easily measured–the game announces skill shots prominently, and (c) is desirable, in that it improves one’s score. See the ramp in the upper-right, that leads into a tree? Hitting that ramp several times starts a special game mode, with the opportunity to score lots of points. Hitting the ramp to start the special mode is, again, (a) independent of winning, (b) measurable, and (c) desirable for the points gained thereby. At the center-top are Yoda’s hut and the Emperor’s throne room. They aren’t just for show. It’s possible to get the ball up there–a goal unto itself–to play a mini-game in which the player uses a smaller set of flippers to hit the ball into targets, with success being worth points. This particular table doesn’t do a perfect job of being (b) measurable here–it’s a bit difficult to tell how the mini-game’s reward works–but (a) one doesn’t have to win to get it and (c) if the player knows about the reward it’s certainly desirable. Listing all the things to do on this table would at least triple the length of this post. See the “fights” listed in the center of the board, near the front? Each of those is an activity unto itself. 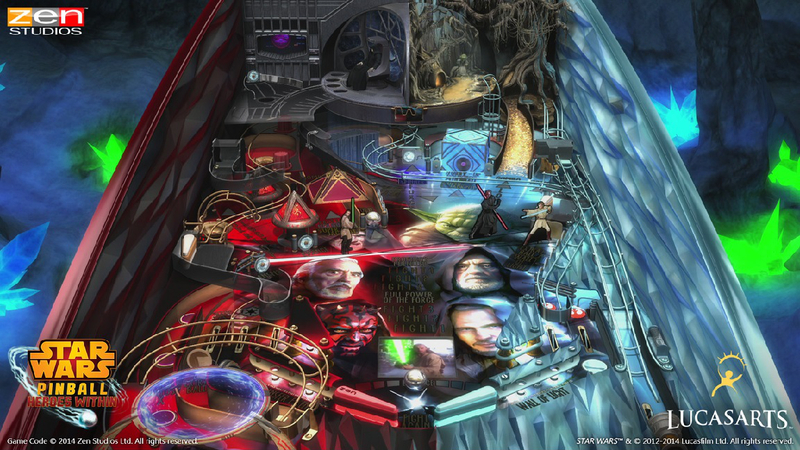 The cutouts of Darth Maul, Qui-Gon Jinn, and Obi-Wan Kenobi are part of one of those fights; the goal is to hit Darth Maul with the ball while avoiding the Jedi. The pyramid to the left can be lowered to create a ramp that jumps the ball toward the upper-left platform. You get the idea.